Mrs. Aileen S. Pendergrass, 93, of Huntingdon, Tennessee passed away Thursday at Jackson Madison General Hospital. Funeral services will be conducted 2:00PM Sunday September 2, 2018 in the Chapel of Dilday-Carter Funeral Home. Interment will follow in Oak Hill Cemetery. Brother Andrew Stokes officiating. Mrs. Pendergrass was born December 27, 1924 to the late L. E. (Linn) Segraves and Mary Elizabeth Robertson Segraves. 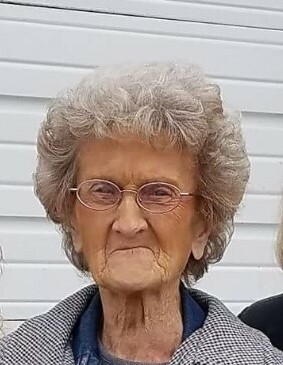 She was a retired employee of Kuhn Variety Store, member of the Huntingdon First Baptist Church. She was preceded in death by her husband James “Mutt” Pendergrass; sisters Maxine Gurley and Alma Jewel Carrington Bond; brother Billy Everett Segraves. She is survived by two daughters Pamela E. Davis of Lexington, Tennessee and Kay Orr of Lexington, Tennessee; five grandchildren James Allen Davis, Tricia Lynn Monney, Mary Beth Jarqin, Cameron Mitchell Orr and Michael Craig Orr and 16 great-grandchildren. The family will receive on Saturday from 4:00PM until 8:00PM and on Sunday from 10:00AM until time of services.